heartbreakingly delicate and lovely. The art form engages the mind as well as the eye through the poems and symbols. The words of the calligraphy can be very inspiring, even if one is not interested in Zen as philosophy or religion. Zen poetry is often earthy and full of common sense. I first became aware of paintings by Japanese Zen masters when I saw a book, Zen Painting, by Awakawa Yasuichi. I was drawn to the cover painting: an exuberant and amusing painting of Hotei laughing so hard that he rolled over backward. I had been deeply interested in Eastern philosophy since student days, so was excited and surprised to find an art form that combined humor and joy with serious spiritual and philosophical meaning. The delight that I saw in that Hotei painting summed up true spirituality. I can still see that book cover in the store window. It was a pivotal moment that changed my life. I did not know it, but it was the beginning of my career as a dealer in Zen art. The love that this first painting evoked in me has deepened over the 23 years that I have had the honor and privilege of helping to bring this art form to the West. Although the artistic qualities are often dynamic-amusing-lovely, it is the sensed spirit of the Zen master himself that is Zen art's real essence and reason for existence. It is understood that when the Zen master brushes a painting, his very life force and enlightenment are imparted to the ink by his intense concentration. For Zen masters, the act of painting is a moving meditation. These paintings were requested by students and lay persons who respected and admired a particular master. They wanted a physical reminder of that sensed spirit to serve as a talisman and inspiration. Zen influences every aspect of Japanese culture yet the art is just starting to be appreciated in the West. A guided tour follows of some masters and themes. Fugai (1568-1654) evokes the most mysterious and deeply intense feeling. Even his name has that quality: it means "Beyond the Wind". You almost feel as though you see his art through a veil or mist. Fugai's Zen meditation gave him depth and character that you feel in his work. the opportunity to make a pilgrimage to the places where Fugai had lived. His main cave was small with an almost cozy feeling. Outside was a beautiful view of Mt. Fuji. Farmers would leave him rice; in exchange he would give them a painting or calligraphy. 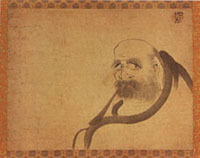 As Daruma (Bodhidharma in Sanskrit) is the first patriarch of Buddhism, he often appears in Zen art. He left India for China where Buddhism was taking hold as a new religion. He was not pleased with the way Buddhism was taught in China and wanted to propagate his austere practices. In a legendary interview with the Emperor of China, Daruma told him that all his efforts on behalf of Buddhism had gained him no merit at all. When the Emperor asked him the first principle of Buddhism, he replied "Vast emptiness, nothing holy!". When the exasperated and probably furious Emperor demanded "Who are you?!". He replied "I don't know", and abruptly departed to meditate nine years facing a wall. Fugai is a master at painting Daruma (fig. A). He knew him inside out, because he lived in much the same way-in seclusion and meditation. Probably for this reason his Darumas have a particularly intense haunting and living quality. Twice in his life Fugai was invited by Daimyo Inaba Masanori to live in Odawara Castle. He left abruptly like Daruma similarly unimpressed. Calligraphy by Fugai is extremely rare. The fine example in fig. 5 reads 'Tenjin' which is the honorary title of Sugawara Michizane (845-903), the patron saint of scholarship and calligraphy. A scholar seeking inspiration probably requested it of Fugai. 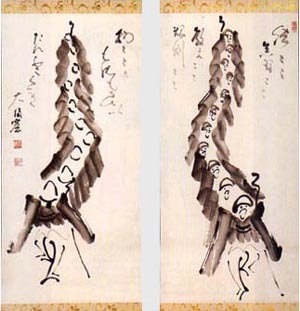 In Zen art, a revered person's name becomes a word portrait, so this work blends portrait and calligraphy. (fig. 6). At times he gives the subject a sad and serious face, but here Hotei shows joy at the beauty of life. 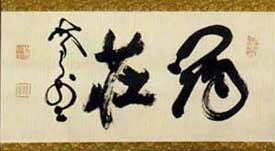 An interesting thing about Zen art is how often the characters evoke the object depicted, as we see in the calligraphy by Daido (1680-1752) (fig. 7). The large character on the right is 'wind'. feeling of transparency and speed. In this character for wind, Daido has shown us the essence of wind itself. (Center) Hail to Amida Buddha. (Sides) Do not create evil. Do all that is good. Sometimes the monks did small portable scrolls that people could take on their travels. fig. 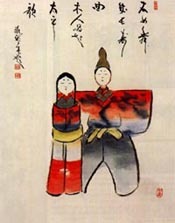 8 by Daishin (1656-1730) is an example. The central line says, "Hail to Amida Buddha". This phrase, called the nembutsu (prayer to Buddha), is not Zen, but a central aspect of the Pure Land School of Buddhism. The calligraphy on the sides says, "Do not create evil, do all that is good"-a famous Zen aphorism and, like so much of Zen calligraphy, good counsel for anyone. It was common for Zen masters to honor and respect the practices of other Buddhist sects and religions by brushing phrases particular to them. They would encourage lay people in whatever they believed. person with a strong personality. From what we know of his life, this is right. As a teacher he was said to be sharp and strict-"the devil of the Tamba mountains". Another example of this same central phrase, done two centuries later by Nantembo (1839-1925), is fig. 23.
fig. 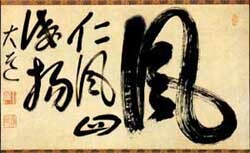 9 Chingyu, "Kanzan and Jittoku"
Single line calligraphy is mainstream for Zen artists and the principal format for tea school scrolls. them to build a temple at Uji near Kyoto. Mampuku-ji, their main temple, is still active today. 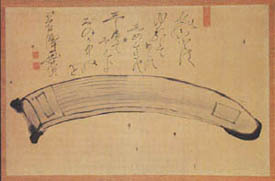 A classical Zen format, also seen in the works by Daido and Gesshu (1618-96) (fig. 12), is a single large character followed by an explanatory poem: it is known as a "one word barrier". The poem "Stone" by Etsuzan (1629-1709) exemplifies how a Zen saying can be valued by ordinary people (fig. 13). A non-Zen practitioner can grasp and gain from recalling the true value of patience and perseverance. Etsuzan came from China in 1657 to study with Mokuan. 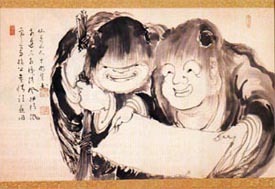 He became 7th abbot of Mampuku-ji in 1705, six years after this painting. Gesshu was an important Japanese monk who received Zen training from Doshagen, a Chinese immigrant monk. His calligraphy reflects this influence. Hakuin (1685-1768) is widely considered the most important Zen master of the last 500 years. He revitalized the koan system of Zen study. In this discipline, the student is given a seemingly nonsensical word puzzle called a koan to solve, such as the one Hakuin himself invented, "What is the sound of one hand clapping?" Once a koan is given, it must be intensely concentrated on at all times until the student's mind, having exhausted every possible answer, gives up and the "correct" answer emerges from the depths of the student's own being. Fig. 14 is a painting of a dragon staff by Hakuin, called an inka, a kind of diploma that Hakuin presented to lay people who solved the "one hand" koan. In his painting of a tray garden (bonseki) (fig. 15), Hakuin used a wet brush to get the beautiful soft, wet ink tones. The fine painting of Kan'non, the Goddess of Compassion (fig. 16), is by Reigen (1721-92) a direct disciple of Hakuin. Compassion and serenity fill this work. It is most unusual for Zen art to reveal the face of compassion in such a deeply loving way. The following two paintings are by Suio (1717-89), another of Hakuin's direct disciples. Together they hint at the importance of strength and gentleness. Rinzai (?-867) was a monk in 9th century China. He is famed for sudden deafening shouts in response to student's questions about the Buddha's nature. He founded the Rinzai sect of Zen to which Hakuin and his disciple Suio belonged. In fig. 4, Rinzai holds a hoe with which he planted pine trees. Manual labor is a respected part of Zen practice. This painting illustrates the Zen master's strength of character and conveys the direct and no-nonsense attitude that Rinzai was famous for. Perhaps the joy of enlightenment is most consistently depicted in paintings of Hotei. Suio's version (fig. 3) has a soft sweet quality. fig. 16 Reigan, "Kan'non", Rougeau Collection; She manifests herself unstintingly for the sake of all beings. Hotei gently holds a flower. In a famous sermon, the Buddha once silently held up a single flower. 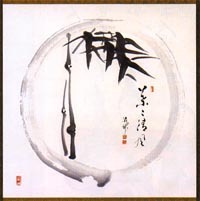 An enso ('circle') is the symbol of Zen itself and so an important art subject. fig. 17 is by an influential monk named Inzan (1758-1817), a 'grand-disciple' of Hakuin who trained many teachers. All of Hakuin Rinzai Zen (there are other schools) today comes through either Inzan or Takuju. The circle itself represents the material world with its endless cycles. The space in the middle represents the emptiness at the heart of Zen. This enso was brushed in two strokes, though one is usual. Inzan was probably trying to show directly the duality of good and evil, male and female...that together make up the whole of our world. Zen art is the only religious art that I know with a sense of humor and delight. My mind is like the autumn moon. Nowhere are these more evident than in Zen paintings of animals. The charming shrimp (fig. 18) by Shunso (1751-1839), a brother monk of Inzan, was probably done for a New Year's celebration. The shrimp is a congratulatory symbol wishing someone long life. Its bent back recalls the posture of someone old. nothing of his history, as his name is unrecorded in large temple rosters.We can safely say that he was in the Hakuin line, as Hakuin liked the theme of the iron rod carried by demons, and often depicted it in much the same style. Yamaoka Tesshu (1836-88) as a Zen layman, master swordsman, calligrapher and influential statesman. During the changeover from Tokugawa rule to Emperor Meiji, he helped arrange the peaceful surrender of Edo Castle, saving many lives on both sides. In 1877 Tesshu was appointed secretary to Emperor Meiji. This dynamic man was over 6 feet tall and weighed 240 lbs (115 kg.) in his 20s. He threw himself into whatever task was at hand, whether a drinking contest or Zen meditation. Tesshu's work (fig. 20) reads 'bamboo thicket'—probably the name of a villa or teahouse. It is a powerful reminder to live life to the fullest, in delicate and lyrical calligraphy on a fan (fig. 21). A well-rounded warrior was also expected to be sensitive and able to express himself in poetry. Tesshu's friend Nantembo was a great 20th century Zen master. The portrait of Daruma by Nantembo (fig. B) is rendered in a classical way: a bearded Caucasian-looking man stares out. A few lines define the robe. An earring hints at his Indian origin. 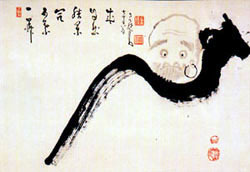 Nantembo's portrait has abbreviated the line of the robe even more than in Fugai's Daruma: a large brush loaded with dark ink defines the line of the robe in a simple, sweeping statement. Nantembo's Daruma has a whimsical, questioning quality. Although the subject is the same, and the composition similar to Fugai's, the feeling is quite different. We intuit their varying characters and personalities. fig. 2 Nantembo, "Daruma", private collection. The form of the grand patriarch facing the wall--or is it a melon or an eggplant from around Yahata in Yamashiro? Nantembo again has fun with the "grand patriarch" in this lively depiction from behind, of Daruma in seated meditation (fig. 2). One brushstroke says it all: no superfluous detail. The poem below exemplifies how Zen monks use humor to treat a serious philosophical concept: the underlying unity of all things. The delightful rooster in fig. 1 is by Tesshu Chisei (1879-1937); just a few strokes give it strength, energy, delight and optimism. Perhaps it was painted to celebrate the year of the rooster in 1933.
fig. 22 Deiryu, "Enso", Rushton Collection; A pure breeze rustles the leaves. Deiryu (1895-1954) was a major disciple of Nantemb6. His enso (fig. 22) is a study in contrasts to that by Inzan (fig. 17) which has solid dark ink, done with a wet brush. The ink has pooled beyond the lines of the enso, giving it a soft quality. of emptiness (often the enso's center); Zen people believe this is the ground of all life. fig. 24 Deiryu, "Girls' Day Dolls", private collection; A stone woman dances to a tune of longevity; a wooden man sings a song of peace. mu (emptiness)—often the first given to Zen students. Kasumi Bunsho (1905-99) clearly grasped its meaning. Solving the koan implies not just grasping the concept, but experiencing the emptiness underlying the material world. Zen practitioners say it involves not just intellectual understanding, but intuitive experience with your whole self. This 'mu' is a particularly fine example. The calligraphy embodies the concept. The character seems to be just emerging from nothingness, yet going back into it, coming toward you, and receding from you simultaneously. With this pair of paintings of monks on their begging rounds (fig. 26), Kasumi Bunsho continues the tradition created by his 'grand-teacher' Nantembo and his teacher Deiryu. Mendicant monks are an important part of Zen practice. It reminds the monks to be humble and that we are all interdependent. They recall that they seek enlightenment not only for themselves, but for all beings. After an overview of the masters and many popular subjects used in this art form, let us look at collectibility. Compared to other schools and forms of Japanese painting, Zen art is affordable as it is only starting to become widely appreciated. Zen art prices begin under $1,000 and the average is $2,000-5,000. A collector lucky enough to acquire the finest Fugai or Hakuin can expect to pay $40,000 or more. The great majority of paintings are scrolls; works also come on fans, screens, wooden plaques and ceramics. Collectors of Zen art come from varied backgrounds. Many are knowledgeable about other art forms, and most are not Zen followers, but drawn to the works' strength, depth, immediacy and vitality. Collectors stress how the paintings reveal themselves over time, giving the viewer new insights with each encounter, and say the paintings have a dynamic, fresh and contemporary feel, although many are hundreds of years old. They are all 'modern', because abstract. Calligraphy lovers are intrigued by the challenge of working within the limits of kanji. What creativity, feeling and originality can be brought to bear within those confines? When I started as a dealer, I knew that forgeries abound in any art form loved and collected over the years. I was lucky early on to study authentication with Professor Stephen Addiss. I have built, and continue to add to, an extensive archive of photographs of seals, signatures and multiple examples of a subject by many Zen artists. The archive has been a valuable tool in determining authenticity, as well as in appreciating an artist's development over time. I am also fortunate to have Professor John Stevens translate the Zen poems on the paintings. He brings his extensive study and practice of Zen and highly developed poetic sensibility to the work.